This month’s book club meeting was out of this world… sorry couldn’t resist a little space humour. 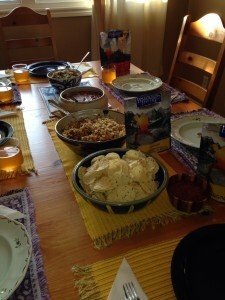 Our host Liz went where no (wo)man has gone before (last one, I promise) and prepared a feast of astronaut food – add a little water and Voila! We had beans, pasta, couscous and for dessert SMORES! It was amazingly delicious. Some of us may even start doing our grocery shopping at the backpackers store. To top of the theme and to maintain solidarity with Chris Hadfield we even had Tang – well Gatorade disguised as Tang since it is now illegal to sell that s^%t. Over supper we had a wonderful discussion about An Astronaut’s Guide to Life. Most really enjoyed it and were very enthusiastic about it. 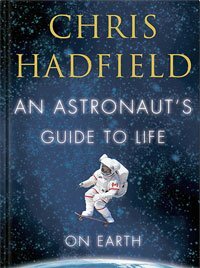 Some were very put off by the narcissistic and egotistical vibe they got from the author, Chris Hadfield. We all agreed that there were elements of this but most of us felt the extreme self confidence & ego were necessary for Chris to overcome the competition and the hurdles to achieve his goal of going to space. This was a book of incredible inspiration for a few of us – the importance of goals, understanding when to be a 0 rather than a -1 or +1, the value of preparation, etc. – while other others struggled to get to the end of the book. We all agreed that the true hero of this story was Helene – we’d love to have a chat with her. There’s little doubt that in this case the woman made the man. Had she not been in Chris’ life we wonder if he would have achieved his dream. This story is ongoing – we wonder what life will look like for Chris as time goes on. His gift has been to bringing the experience of being in space to the rest us through his images and videos. The book gave us further insight into the space program and it’s value. Aside from Peggy, a self proclaimed space geek, none of us knew much about it. This was a great way to finish up Book Club for the summer. Thank you Liz for a truly wonderful evening. See you in the fall Wormies! I totally agree if Chris didn’t have his wife’s unconditional support he wouldn’t have been able to make his dream of becoming an astronaut come to fruition when it actually did. Having Helene’s positive attitude and encouragement is what truly made the difference She packed up the whole family and moved to wherever Chris needed to be not every wife could or would do that especially if they were already happy in their current hometown.